Place the mushroom caps, smooth side up, in a shallow dish. In a small bowl, whisk together vinegar, oil, basil, oregano, garlic, salt, and pepper. Pour over the mushrooms. Let stand at room temperature for 15 minutes or so, turning twice. Preheat grill to medium-high heat. Brush grate with oil. 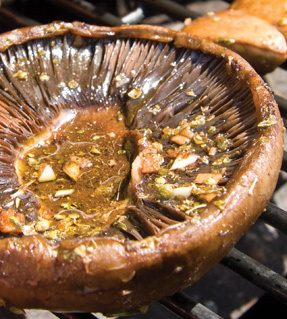 Place mushrooms on the grill, reserving marinade for basting. Grill for 5 to 8 minutes on each side, or until tender. Brush with marinade frequently. Serve with lettuce, tomato, and onions and no bun. This entry was posted in Entrees, Metabolic Medical Center Recipes, Party & Entertaining, Vegetables and tagged burger, grill-out, grilled mushroom, metabolic diet recipes, mushroom burgers, portabello mushrooms, Vegetable, vegetarian by foodies4mmc. Bookmark the permalink.